McIntosh was the Labor Party's representative on the Parliamentary Delegation to the UN General Assembly. 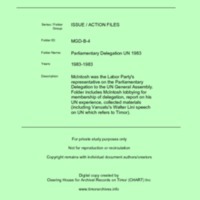 Folder includes McIntosh lobbying for membership of delegation, report on his UN experience, collected materials (including Vanuatu's Walter Lini speech on UN which refers to Timor). “Parliamentary Delegation UN 1983 [MGD B4],” CHART DIGITAL, accessed April 18, 2019, http://chart-digital.info/items/show/631.